Austin’s AMERICAN SHARKS are thrilled to share their latest music video with the worldwide exclusive premiere of "Freak Out", which you can check out right HERE. Director Gregory Groves and producer Allan Smoothie have brought ceremonial alien rituals to life with past collaborations for Tim & Eric's Pusswhip Banggang. Now the team expands on the fact with their newest video release for the AMERICAN SHARKS. “Surfing rivers of blood, cryo chambers of mutant sharks, various predators, aliens, termination machines and thousands of pizza slices gone in 60 seconds is normal here... We deal with this every day... Le bon rouleau de temps”, says Smoothie. From the videos opening scene with the band performing at the Bohemian Grove, the video concept itself is based entirely off several original bong rips so the meaning behind it all comes from a deep fog. Allan Smoothie is not a Mormon but he is crafting a complete personal universe with all the trimmings. The SHARKS are now part of that "Smoothieverse". The Smoothie team has tapped into the deep subconscious, a place where anything is possible and at any speed. The ceremonial alien "Freak Out” pigeonholes a rip tide rush. "If someone “finds" a good idea that they are excited enough to share with us we usually go for it", adds Smoothie. Thanks to Smoothie and Groves, "Freak Out" comes out completely sideways as its creators intended. The SHARKS are currently on the road supporting metal warmongers GWAR on the "GWAR Eternal Tour 2014". 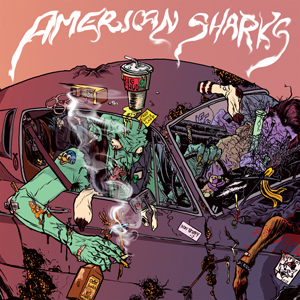 Having toured extensively through 2014 with acts such as CLUTCH, THE SWORD, RED FANG, BIG BUSINESS, CASTLE and WHORES, AMERICAN SHARKS have honed their craft firing through songs until their (and most times, the crowd’s) tank is empty.